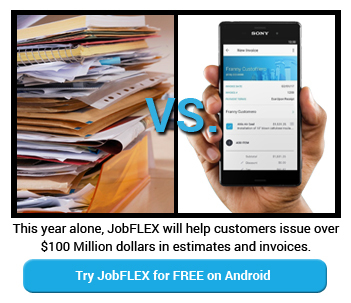 As the creator of JobFLEX, a market leading invoicing software, we’re well aware of the headaches contractors and other small business owners face when it comes to getting paid on time. We know that one of the key elements to getting paid on time is having proper invoice payment terms. If you are a business owner that struggles with developing crystal-clear payment terms, the information below could be just what you need to help fix your cash flow issues. Having payment terms in place allows you to have some form of communication with your client in terms of the expectations that are required prior to, during or after you complete a project. Another bonus of clear payment terms is the ability to better forecast your revenue and manage your cash flow. Once you have an effective system in place, your forecasts will become more accurate allowing you to better plan your business expenses such as buying new equipment or adding more staff. Before you can present your customer with payment terms, it’s important for you to have a solid grasp on the available options to determine the best fit for your business. Some invoice payment terms are based on contracts or service agreements for long-term or short-term projects. In cases such as these, it’s common to accept an initial upfront deposit before beginning the work, with the balance due on receipt. We recommend this approach for contractors as it reduces cash flow issues by helping cover the initial costs for labor and materials. Payable on Receipt. This is a common form of payment where full payment is due upon completion of the project. Many businesses use this approach so that customers are aware that there’s no leeway for delaying payment once the project is done, as the business has the right to reclaim their goods if not paid immediately. Net 30/60/90. These payment terms extend a window for the customer to make the full payment. As you might imagine, a Net 30 payment term allows 30 days for full payment, while Net 60 and Net 90 offer 60 and 90 day payment periods. While larger organizations who rarely face cash flow issues might offer these terms to attract more customers with flexible payment terms, these longer windows can cause major cash flow strains for smaller businesses. 2/10, Net 30. To incentivize customers, it’s common for small businesses to offer a discount for early payment. What that means is that although the terms are set at 30, 60 or 90 days, a discount is usually offered for 1 or 2% of the invoice amount if it is paid sooner. It’s usually written like this – 2/10, Net 30. What that means is that the arrangement is for payment to be received in full in 30 days, however, if it’s paid within 10 days the customer will receive a 2% discount. In businesses where customers may shy away from companies that only use payable on receipt, this can be an excellent approach to getting paid more quickly. One way to avoid miscommunication and delays when working with a new customer is to have a discussion about payment terms and the arrangements in advance. 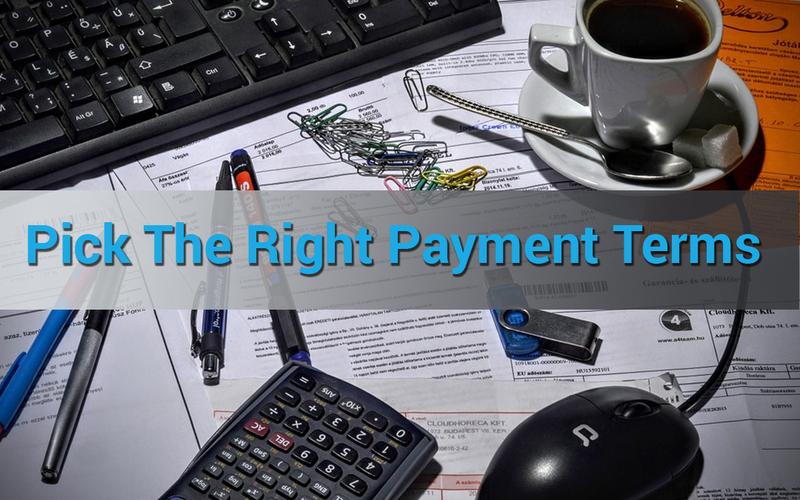 Spelling out the payment terms, along with any late payment penalties or early payment incentives, within the initial estimate is important. It’s also critical to have a conversation about the terms with the customer before you begin the project. Getting the payment terms out in the open helps to clarify things for your customer and helps ensure that you will get paid on time. Default invoice terms. 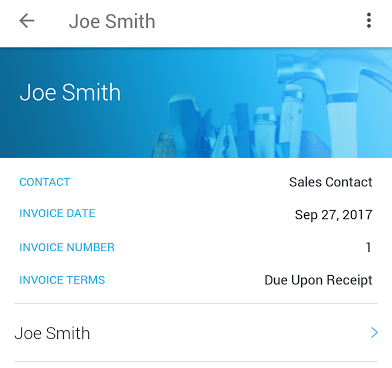 If you decide your business will require all jobs to be payable on receipt, every time you create an invoice you can set the default to include your custom invoice verbiage to explain your terms. Default contract terms. If your job requires an upfront payment, you can include that in the default contract terms on all of your quotes. You can also include the payment terms, along with any late payment terms, so that every one of your customers has a written record of all of your terms before they agree to any work. Late payment reporting. If any customers do manage to fall behind, you can quickly and easily run a report on any payments that are past due and follow up with those customers to make sure they get their check in the mail ASAP.